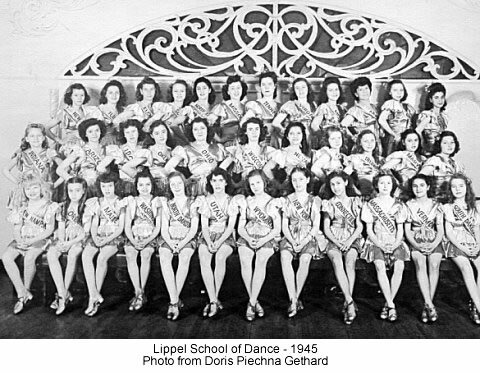 When I think of downtown Newark in the 1940s, I can't help but remember the Lippel School of Dance, located on the second floor behind Lowes Theater on Broad St. For 8 years I traveled by bus from Ridgewood Ave to attend tap, ballet and toe classes which ultimately finished out each year with a recital at the Mosque Theater, across from Lincoln Park. The performances were as professional as you would see on Broadway today and several of the students went on to become Rockets. I wish I could remember their names. Remember Peggy Ann Garner? She was a Lippel Cutie Kid. As young as 10 years old, I can remember boarding the #13, 14 or 16 Public Service Bus for my journey down Clinton Ave, past High St and Lincoln Park to Broad St. Heading towards Military Park we would pass the Jersey Central RR, and past Peddy's Drug Store where you could get the best Awful Awfuls, past Kleins and the Wiss Building and finally to Lowes theater. I'm curious to know if anyone remembers the above 1945 photo of the group performing to a song and tap dance in which each girl represented one of the 48 states. Yes, that was before Alaska and Hawaii joined the Union.